Note to parents: Some versions of this film are displayed in the 3D or IMAX format and some younger children may find them a more intense experience. Synopsis: CAPTAIN MARVEL is a sci-fi fantasy adventure in which a pilot becomes embroiled in an alien war. 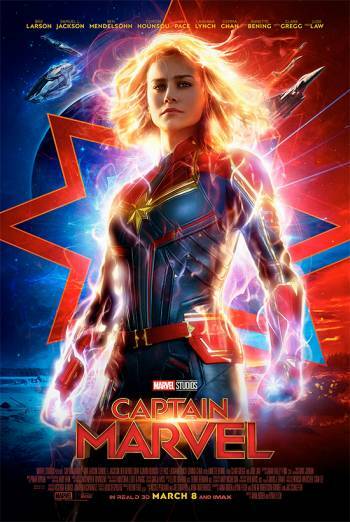 CAPTAIN MARVEL is a US superhero sci-fi fantasy adventure in which a pilot must rediscover her past and find out about her life during an alien war. Scenes include fistfights, gunfights and aerial dogfights involving fantastical powers and weaponry. Resulting injuries are brief and largely un-detailed, although there is partial sight of an alien autopsy. There is mild bad language and wordplay on a strong term. Men are seen mocking the protagonist's abilities, but the film does not condone or endorse sexist behaviour. More information about the content of this film is available for parents on the main BBFC website and the free to download BBFC app.